You'll have to flip to page D4 of today's Wall Street Journal to find the most interesting and important story of the day. Here's what's happening. Faced with a recession and onerous new consumer-friendly regulations, credit card companies are looking to manage their risk more carefully than they ever have before. One way to do that? Eliminate fixed-rate credit cards. The Wall Street Journalreports (subscription required) that "Nearly all of Bank of America's fixed-rate cards will be converted to a variable rate. The exceptions: some student accounts, accounts in debt-assistance programs and some newly opened accounts, says spokeswoman Betty Reiss. At BofA, customers will not be able to opt out of the changes, which they will start to see with August statements." The reason this matters so much is that all the money that's being printed will almost certainly lead to inflation and, even more certainly, rising interest rates. In a recent interview with DailyFinance, Fox Business' Cody Willard told me that "Betting on higher interest rates is I think the easiest, no-brain thing, probably for the next two to five years. If rates triple in the next two years, you might have to get out of it." Black Swan guru Nassim Nicholas Taleb recently set up a new fund that exists for the sole purpose of betting on soaring interest rates -- after providing his investors with a gain of more than 100 percent in 2008. If the seemingly reasonable predictions of Willard and Taleb come to fruition, anyone who has a credit card will be in deep, deep trouble as their interest rates and monthly payments soar. And unlike with the adjustable rate mortgages that led to the current fiasco, there are no limits on how much the rate can rise each year -- or month. Of households that have one or more credit cards, the average debt load is around $10,600. The prime rate is currently 3.25 percent, so an account with a balance of $10,600 with a variable rate of prime plus 8 percent would require a minimum monthly payment of $205, according to this calculator (the actual number will vary depending on how a given borrower's minimum payment is calculated). That's manageable because the prime rate is very low right now. But in the late 1970s, it soared to well over 10 percent, and hit 19 percent. What if it goes to 12 percent on inflationary concerns? The minimum monthly payment jumps to $283 -- an increase of 38 percent. And remember: The banks wouldn't be in such a rush to shift out of fixed-rate cards if they didn't know that interest rates are going to rise pretty soon. With large balances and variable interest rates, consumers have absolutely no idea what their monthly payments will be a year from now. Given how precarious the average family's situation is right now, that should terrify all of us. 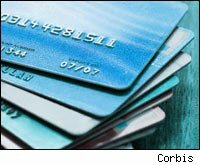 With credit card default rates already on the rise along with unemployment, the combination of shifting fixed-rate accounts to variable rates on the eve of rising interest rates has the potential to wreak absolute havoc on the finances of the American people -- and 74.9 percent of households have credit cards, with 58.0 percent carrying a balance each month, according to the United States Census Bureau. In terms of the sheer number of households that will be affected by rising interests rates on credit cards, this makes the adjustable-rate mortgage mess look like a flaky subculture. What's the alternative? I'm not really sure there is one. Requiring the banks to keep the fixed-rate accounts would result in significant losses for them if interest rates rise and their cost of capital soars above the interest rates they're collecting. But if interest rates start to rise soon, this recession could turn into a real doozie.